Do I need a travel adapter for a trip to the Turks and Caicos Islands? 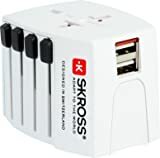 Yes, you need a travel adapter (plug adapter) for a trip from the United Kingdom to the Turks and Caicos Islands. On the Turks and Caicos Islands, people are using different plugs and plug sockets that are not compatible with plugs from the United Kingdom! The Turks and Caicos Islands are a country in America (Caribbean) with about 50 000 inhabitants on an area of almost 948 km². The capital of the Turks and Caicos Islands is Cockburn Town (4 000 inhabitants). The Turks and Caicos Islands do not have a neighbor country. Which types of plugs are used on the Turks and Caicos Islands? The Turks and Caicos Islands use plugs of type A and B. Plug sockets of type G, which are common in the United Kingdom, are not in use on the Turks and Caicos Islands. What is the Electricity Voltage on the Turks and Caicos Islands? The voltage on the Turks and Caicos Islands is 120 volts. If the voltage stated in the user's manual or on the device's power supply differs from the mains voltage on the Turks and Caicos Islands, you should either not use your device there, or buy a voltage converter before departing. What is the utility frequency on the Turks and Caicos Islands? The utility frequency on the Turks and Caicos Islands is 60 Hertz. Devices that either measure time, or are equipped with moving and rotating parts, are particularly dangerous! So, if you plan to use shavers, heaters, kitchen appliances or alarm clocks on the Turks and Caicos Islands, read the instruction manuals to see if these devices are safe to use on the local utility frequency. If the mains frequency specified in the manual or on the power supply is different from the rate used on the Turks and Caicos Islands, you should not use the device!